The Design Lab opened in March 2018, with its construction, furnishings and equipment funded by the Scarsdale Schools Education Foundation. Maker/Design spaces are among the newest and most important educational innovations at many universities, including Harvard, MIT and Stanford, as well as in schools like Newton North (MA) High School and Horace Greeley in Chappaqua. The District decided in 2014 that it was time to offer Scarsdale students and teachers similar opportunities — and asked the Foundation to fund its creation. The new Design Lab at the high school now offers our students the opportunity to apply problem-solving skills in situations that call for collaborative learning, global awareness and human-centered innovation. We recognize the responsibility of Scarsdale High School to equip its graduates with the 21st century skills to succeed in college and careers. 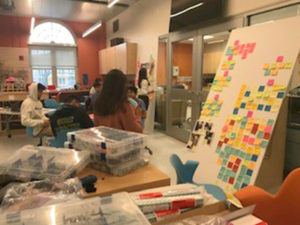 The educational goals of Scarsdale’s Design Lab and Maker Space mirror those of Stanford’s Design School, including critical thinking, information literacy, patience and persistence, creativity/innovation, self-motivation, and the desire to pursue a passion and make a difference. 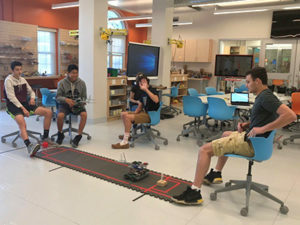 The “D-Lab” improves Scarsdale students’ preparation in the STEAM subjects (science, technology, engineering, arts and math) by providing a space to introduce new courses and teaching methods. As a place for developing, prototyping and testing, the D-Lab features a large open area accommodating up to two classes at a time, along with space for independent study and group design projects. Supporting a curriculum for creativity and experiential learning, the Design Lab and Maker Space gives students access to CAD/CAM programs, laser cutters, 3-D printers and their attendant computers, circuit boards, Arduinos and other electronic materials, as well as more traditional tools. Permanent fixtures in the lab are complemented with open space to be reconfigured for specific projects and as needs evolve. As a place for developing and evaluating ideas, the new space also facilitates an emergent interdisciplinary curriculum thread — engaging students in the design process and the invention and production of objects such as three dimensional models. We recognize that there is a growing emphasis on Design Thinking in schools, colleges and businesses today. The Design Lab at Scarsdale High School facilitates a structured process by which our students learn how to define a problem, generate potential solutions, prototype those ideas or products, test the results and learn from the outcome. How are Scarsdale students using the Design Lab? See "Yehuda's Chair" featuring Zach Friedman's 2018 Senior Project.